I didn’t choose the women’s game, the women’s game chose me,” said Pedro Martínez Losa as he reflected on a career on a now decade-long association which has seen him win three La Liga titles in a row, one Copa de la Reina, a Continental Cup, and an FA Cup final at Wembley, plus a National Women’s Soccer League (NWSL) regular-season shield as assistant coach and recognition three coach of the year recognitions from the Spanish FA. Now 41, the former Arsenal manager, who left the club in October 2017, has taken on a new and exciting challenge outside of football — fatherhood. “There’s been a lot of sleepless nights. Bottles, changing the baby, that kind of thing,” he laughed. “It’s been an incredible experience, being there for the birth in the hospital and watching my baby grow day after day. Losa’s association with the women’s game started back in 2005 and lasted until 2017 when he left Arsenal three years after taking over from current Scotland head coach Shelley Kerr. His first job was with Pozuelo Alarcón, a club on the outskirts of Spain’s capital Madrid. Losa’s success there saw him take on the job of Rayo Vallecano manager where he would win three consecutive league titles. “Pozuelo had a young team but the president was a close friend of mine,” he recalled. “He convinced me to coach the women’s team, being in the first division of La Liga made it probably the most important team in the club because the men were in the third division. Losa’s growing reputation saw him hired by NWSL side Western New York Flash as assistant to Aaran Lines. The Flash finished joint top of the NWSL in his first season there before Arsenal came calling at the end of his second year in New York. “After two years they offered me the head coach role but I wanted to go to London,” said Losa. 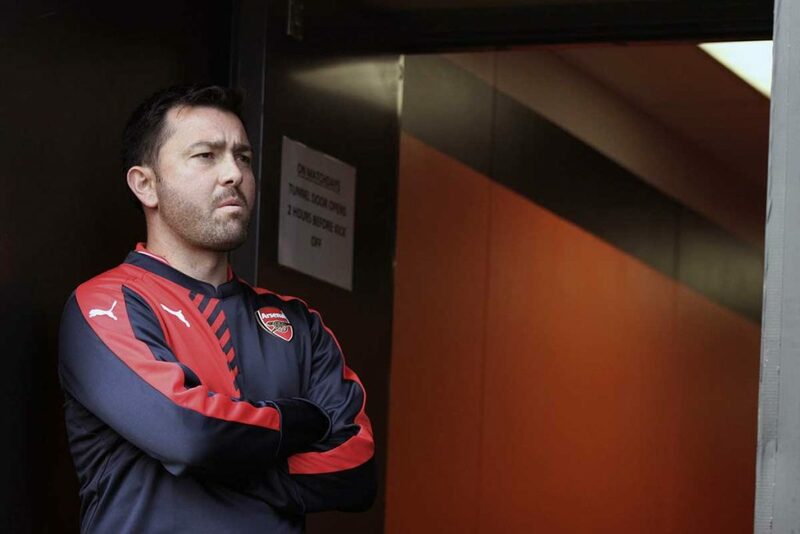 “I met with Clare Wheatley [Arsenal’s general manager] in New York City and she told me I was the right person for the job, the person to bring the club from one level to the next level of professionalism. Arsenal’s reign of dominance in English football had been ended by Liverpool in 2013; Arsenal were also on the brink of falling out of the title race by the time Losa took over for the final four games of the 2014 season. With plenty of work to do, Losa set out to improve the club’s fortunes both on and off the pitch in time for the start of his first full campaign with the team in 2015. The Spaniard wasted no time forcing his imprint on the club as a big turnaround in players left Arsenal lagging behind their rivals once again in 2015. Japanese international duo Yukari Kinga and Shinobu Ohno returned to Japan while Niamh Fahey, Christie Murray, and Caroline Weir all left the club, too. Losa recruited familiar faces, including Spanish trio Natalia Pablos, who Losa worked with at Rayo Vallecano, Vicky Losada, and Marta Corredera. Jemma Rose was also recruited alongside U.S. youngster Chioma Ubogagu, and they were joined in the summer by Dutch duo Dominique Janssen and Sari van Veenendaal. Losa also recruited Daniëlle van de Donk, Heather O’Reilly, Katie McCabe, Anna Moorhouse, and other youngsters who came through the youth system. England striker Lianne Sanderson also joined but left the club halfway through Losa’s first season in charge and the new boss admits recruiting players wasn’t as easy as it looked. But aside from an array of big signings from across the continent, Losa also tried to stick to the tradition Arsenal had of bringing through their own talented youngsters to follow in the footsteps of Smith, Rachel Yankey, Alex Scott and Co.
“When I arrived, we had eighteen players, a couple of injuries, and the challenge we had was we had many players who were already over thirty,” he said. “It was a chance to plan for the future and my focus was to give opportunities to young players. We brought through the system forty-five players who at one point trained with the first team. The likes of Leah Williamson, Lotte Wubben-Moy, Anna Patten, Charlie Devlin, Carla Humphrey, Chloe Kelly, Lauren James, Ava Kuyken, Anna Filbey, Shannon Cooke, Jess Ngunga, et cetera were all players we believed in and they were willing to take that opportunity. “We had a strategy: One: to create the most professional environment; two: to attract top players around the world; three: deep the core of the club; and four: give opportunities to the youngsters. I think we achieved all four. Losa does accept that alongside the players he did sign, one talented youngster slipped through the net come the back end of the 2015 season. “One of our main targets was Fran Kirby when she was at Reading. We tried to find the balance between experienced and young signings. While Arsenal failed to mount an assault on the FA WSL as Losa tried to get his squad in shape over the course of the season, the Gunners did continue their tradition of winning silverware with a 3-0 win over Notts County in the Continental Cup final, giving Losa his first trophy in English football. “I worked with the players to change our situation, I had to convince them we could win and get into that space with Chelsea and Manchester City. I always insisted a lot on mental strength and belief in what we were going to do. It was another on-off season in 2016 FA WSL season as Arsenal once again finished outside the Champions League spots and 10 points behind champions Manchester City at the end of a campaign, which did see them pick up silverware in the form of the FA Cup. Inconsistency at home was the big issue as Arsenal won away at both Liverpool and Chelsea but lost at home to both sides as well as Nick Cushing’s City team. But Losa’s hard work was rewarded with the chance to lead his team out at Wembley for the FA Cup final against the previous year’s winners, Emma Hayes’s Chelsea. Danielle Carter’s first-half strike was enough to ensure Losa could do what many greats have done and walk up the famous Wembley steps to collect the trophy. But behind the scenes Losa was preparing for a moment that would be crucial to his future at the club and how the team moved forward into 2017. Long-term legends of the club Rachel Yankey and Emma Byrne left the club at the end of 2016 after Casey Stoney had agreed with the club to leave before the season ended, and the ultimate club legend Kelly Smith announced her retirement early in 2017. Losa admits letting go of so many club legends wasn’t an “enjoyable” moment but something he didn’t question himself on ahead of the 2017 Spring Series. “When you talk about players leaving, you have to make decisions, you don’t need to have everyone on your side,” he said. “We all go through that but I was clear in my head of what I wanted to achieve and I think it was the right decision for the club. “It was never personal, it was professional and it was in the best interests. It wasn’t about Pedro Losa, it was Arsenal and we all agreed it was best for the club. I was the man who had to be in front of these players and it was not easy to have these conversations with Casey or Kelly or Rachel or Emma; you’d rather be having a coffee but someone had to do that job and Arsenal chose me to do it. Despite the big changes in the playing staff, Losa says it was a club decision to make minimal additions ahead of the eight-game Spring Series in order to give chances to the team’s younger players. Defensive duo Anna Patten and Lotte Wubben-Moy played every game of the series before leaving for the U.S. and only Heather O’Reilly, Beth Mead, Anna Moorhouse, and the returning Kim Little joined the club during the offseason. Arsenal finished the Spring Series unbeaten with a young team, one point behind Chelsea and Manchester City. After recruiting Netherlands sensation Vivianne Miedema and several other players to bulk up the squad, Losa suddenly found himself caught between a rock and a hard place as he tried to launch an attack on the league’s top two teams while still giving chances to the club’s young talent. “Kim Little, we were trying to sign for three years; she came to London from time to time during preseason and has always been an incredible player,” he said. “She was the number one objective and Vivianne, we spent a year signing her. We had big competitors like Man City and PSG whilst Heather came over for a very low salary for the level she represented and she loved the experience of coming here. It led to Chloe Kelly moving to Everton on loan, Charlie Devlin to Millwall, and Carla Humphrey to Bristol City as Arsenal kicked off the new season with a last-minute win against Birmingham City followed by a damaging 2-5 defeat away at Manchester City, a ground they’d won on during the Spring Series. A 1-1 draw with Bristol City followed and Losa’s fate at the club was practically sealed, but the former manager says his preparations were hindered by the European Championships ahead of the new campaign. “After the Euros we had a lot of players out there and they came back in different groups. We played [Turbine] Potsdam in preseason and it was really our development team because everyone else was resting. Despite the announcement of Losa’s departure not coming until the October international break, the manager believes his time was up after the defeat against Manchester City in September. “I love the club, it is a special club, I am happy to have been given the chance to contribute and I was treated always following the principles of the club. I will never say a bad word. Losa still wants his former players to do well and believes his team always competed well with the top sides. “I don’t think we lost away to Chelsea when I was there and with Manchester City it was always very close, we beat them in the Spring Series. So, what does the future hold? Plenty of attractive jobs have come up within the women’s game during Losa’s time out of management, including the England job after Mark Sampson was sacked shortly before Losa himself left Arsenal. But Losa has received plenty of interest from clubs in the women’s game both home and abroad and he admits he’d like to stay in England with his family settled in the country unless something really attractive comes up. Despite his long-term association with the women’s game, Losa says the closest he came to a new job actually came in the Championship in the men’s side of the game. “We had a very close option with a Championship club but it didn’t happen, I was really excited about that one and now I think I’ll wait until the end of the season. There’s a few options in the air, I’m open to any position if a club thinks I can help to develop players and win trophies. Losa’s learned plenty about fatherhood since his daughter Anabela was born last month, but he admits the one lesson he has learned the most in his job is to say no to more things.